One of my favorite things about this time of year is the delectable Delicata squash. This winter squash is not only delicious, but is a good source of nutrients like beta-carotene, fiber, potassium, vitamins B and C, magnesium and manganese. Delicata squash can also be called peanut, Bohemian or sweet potato squash. 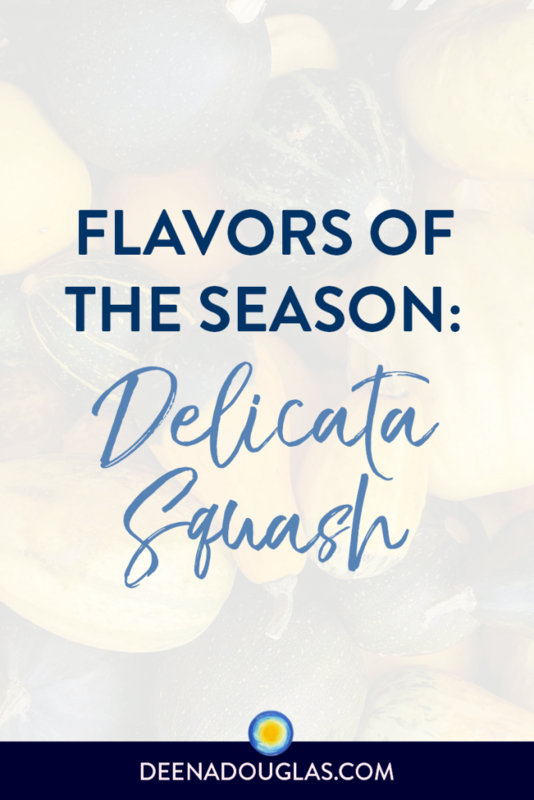 Delicata is an heirloom squash that has only become popular in the last 10 to 15 years. It is very unusual: It tastes like a sweet potato, but has the texture of squash. The sweet, creamy flesh is so yummy! It doesn’t even need to be sweetened, like some of the other winter squash. Wash and dry the squash. Then cut off the top where the stem is, just to make it easy to cut in half. Cut in half lengthwise. This can be a little tricky because it’s a hard squash. I usually start at the end where I’ve cut off the top, and cut down through one of the the green indented grooves and then up the other side. Once it’s cut in half lengthwise, scoop out the seeds. You can reserve them for roasting if you wish, as they can be prepared like pumpkin seeds. In a microwave-safe bowl, add about 1/2 inch of water. Place the two halves, cut side up, into the bowl. Cover the bowl and place in the microwave. For one squash, microwave on high for 8 minutes. This is based on a 1000-watt microwave. If you’re cooking two squash, you’ll need to adjust the time accordingly. It is done when you can pierce the flesh with a fork easily. You want it to be soft and creamy, not hard. These are generally good-sized squash, so one squash could easily serve two people as a side dish. The next time you’re at the grocery store or your local food coop, check out the Delicata, and let me know what you think… Enjoy!